It was a lovely spring morning; giants were getting new tattoos and the rest of the Small World inhabitants were preparing for another day of conquests. An eerie silence settled on the land as a huge shadow glided over forest and mountain. Had the Wizards accidentally given their flocks of sheep flight again? 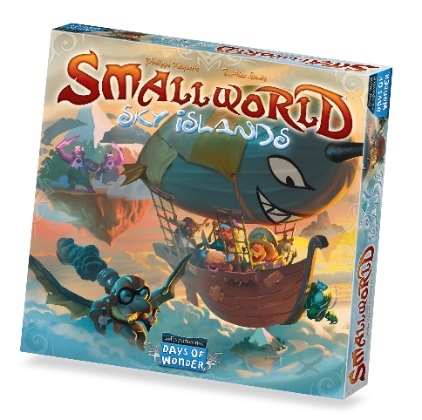 In Sky Islands, an expansion designed by Philippe Keyaerts and T. Alex Davis, new lands are floating closer, but the world remains too small�and that�s not going away with the new board featuring the floating Sky Islands. Each island completely conquered by a single Race will earn additional coins for that race, but accessing the Sky Islands is not easy. To help the players in their conquests, this expansion also features an assortment of new and zany races and special powers, such as the Scavengers, created by Sam Iam Lasseter, or the impressive Storm Giant, created by T. Alex Davis. To sort them all, a storage tray is included in this expansion. Not a Complete Game. A copy of Small World� is required to play.